Our adventure in Joomla 1.5 (now 1.5RC2) continues, we have taken further steps in the development of a WAI compliant XHTML strict template. Read this article to discover what we have done so far. 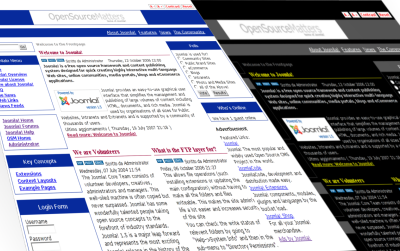 The new template override feature available in Joomla! 1.5 allows an easy creation of custom template, we can see an example of such an effort in the Beez template available with the distribution. Unfortunately, this template is not XHTML strict but use the transitional doctype instead. As discussed in the previous article Joomla 1.5 XHTML Strict Template, most of the core components can now be overridden in the template, but a couple of issues remains: some unvalid code snippets that are still produced in the core and the WYSIWYG editor doesn’t produce valid code that follows the strict doctype. The only solution we have found at the moment is patching the core. We have already completed most of the steps listed in the first paragraph. We are still working on fixing some components output in the template and we are exploring the different options for accesskey support. We will be very happy to hear you opinions and comments about this project.